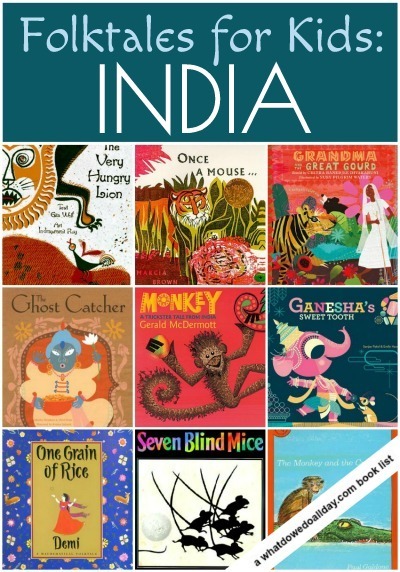 Today I am sharing picture books featuring folktales from India for kids. Part of the challenge of curating book lists of folktales from around the world is how to organize them. The continent of Asia is the most glaring example. Asia is a huge, diverse continent and there are not necessarily enough books to make individual lists for each country. India is an exception (as are a few others, as you shall see) so it’s an easy place for me to begin. It would not be an overstatement to tell you that all of my knowledge about Indian folklore and Hinduism is entirely gleaned from the picture books below (and maybe whatever was mentioned in The Little Princess, if that is even accurate — I don’t know). I hope my kids do not grow up to be so ignorant. The benefit of knowing little, of course, is that there is a joy to learning about a culture along side your kids. You will also be able to find anthologies of Indian folktales, (I came across a few) but as with my other lists I am limiting these selections to single story picture books. As with all my folktale lists, I’m reminding you that the entire Indian subcontinent is not represented by any single book and to please also make an effort to read books showing diverse characters in everyday contemporary life. Rama and the Demon King: An Ancient Tale from India . The good prince, Rama, is hated by his stepmother who convinces her husband to send him away for 14 years. Rama’s brother and wife love him and leave with him. Ravana, the 10 headed king of the demons, steals away his wife but goodness and wisdom eventually win over. The pacing of the text is really well done and the story is captivating. The cut-paper collages remind me of shadow puppet theater (a favorite of mine). Once a Mouse… . Marcia Brown’s Cinderella was one of my favorite books as a kid and almost every kid has listened rapturously to her story Stone Soup . Her third Caldecott-winning book, Once a Mouse… is based on an Indian fable. A hermit with magical powers saves a mouse by turning him into different animals, but when he becomes a prideful tiger, he must learn a lesson in humility. One thing I like about these types of fables is that the moral lesson is nestled in a layered tale. Morals may work their way into little minds but parents don’t have the bore of reading a groan-inducing didactic story. Grandma and the Great Gourd: A Bengali Folktale . When Grandma sets out to visit her daughter she must travel through the jungle. On the way, many wild animals threaten to eat her, but she puts them off by explaining she will be plumper on the journey home (after she has feasted at her daughter’s table). Her hide-in-a-gourd strategy on the way home fools everyone but the fox, but her faithful dogs save the day (and her). No Dinner! : The Story of the Old Woman and the Pumpkin is another version of this tale. Seven Blind Mice . This is an Indian fable (although unfortunately my paperback version did not include any information about the source or history of the story) about the importance of seeing things as a whole. Over the course of a week, seven blind mice try to identify the “strange something” that they run into. Unable to guess the animal from single parts, when the final mouse runs across the elephant’s back, they are able to figure it out. Spare but striking cut-paper collage illustrations will appeal to kids. One Grain Of Rice: A Mathematical Folktale . Mathematics and Morals together! Any story that revolves around math is a big hit with my older son and any story that teaches the importance of kindness is a bit hit with me. A selfish raja keeps all the rice to himself during a time of famine, despite his promise to share with his people. However, he offers a young girl the choice of either 30 days worth of rice or the option of doubling the amount of rice each day starting with only one grain. The incorporation of factorials reminded me of the book Anno’s Mysterious Multiplying Jar , but the folktale framework makes the concept more accessible to kids who may not be as obsessed with math as my son. The Rajah’s Rice is a similar book. Ganesha’s Sweet Tooth . The author clarifies his story is an adaptation of how Ganesha came to transcribe the Mahabharata with his tusk; it’s not a retelling and some of the events do not appear in traditional Hindu mythology. Nonetheless, it is a wonderful book and my kids loved the story of a kid who was “like any other kid… except that he had an elephant head” and is addicted to sweets. It also reinforced my rule of no chewing hard candy! Pixar animator Sanjay Patel’s illustrations are irresistible. Kids interested in learning more about Hindu gods and goddesses will enjoy The Little Book of Hindu Deities: From the Goddess of Wealth to the Sacred Cow . Older kids will enjoy Patel’s Ramayana: Divine Loophole . Patel is one to watch and I expect he will have more offerings in the future! Monkey: A Trickster Tale from India and The Monkey and the Crocodile: A Jataka Tale from India. McDermott and Galdone are both prolific folktale adapters so it is not surprising they each have a version of the monkey and crocodile tale. A monkey wants some fruit growing on an island. The only way for him to get it is to trick a crocodile into taking him to the island without eating him. But can he trick him twice? Trickster tales are always a big hit with my 4 year old. Very Hungry Lion . The pages of this book are made from silk-screened images on to rice and cotton paper. A note in the back explains the illustrations were adapted from the Warli tradition of folk painting in western India. A hungry lion decides he is too lazy to hunt and goes to get a goat from the village market. Along the way he meets a sparrow who tricks the lion into performing all sorts of tasks after which the lion determines it would have been much less work just to go hunting in the first place! This book is out of print, but check your local library. The Ghost Catcher . Admit it, sometimes you judge a book by its cover. Well, I judged this one. But I was wrong. I really enjoyed this book and the cover does not do justice either to the text or the illustrations. In this retelling of a Bengali folktale, a barber who is too kind to accept payment from his struggling friends sets out to cut the hair of strangers. On the way he meets a ghost who threatens to eat him. The barber tricks him into providing for his family so that he can continue to provide his services gratis to those in need. One of the most interesting touches is that the barber wears glasses – not something you often see in picture books on anyone but the elderly. Do you have any folktales from India to recommend? These look amazing- I pinned it to delve into with my kids as a mini-India-learning-session. We may even be inspired to do an art project! I just posted a roundup of African art projects today, too- on a culture kick…. An Indian art project would be awesome! Great list! We read tons of myths and fairy tales from India but as collections. My latest post on them was here – http://learningwithmouse.blogspot.com/2013/01/the-childrens-bookshelftales-from.html. It always amazes me how some myths are the same between various cultures and some completely different. One thing that I found the hard way – Indian tales need to be previewed, since they tend to be somewhat “graphic”. One book I got pictured Ganesha as a boy with his head cut off and lying separately – eww! Awesome! I have been looking forward to this list and am glad to find it! Many of our favorites here and one new one too! Thanks Erica. we are looking forward to reading these! Love this list! Will be reading these with my kiddos! We just randomly checked out Indian Tales by Najli from the library, and it is excellent. My 6 year old son and I have been enjoying the stories, and would love to find something else similar.